25 years ago this month, in May 1989, Tavistock Books came into being- without capital, without business plan, without significant inventory. A rather inauspicious debut… and to be honest, one I never really expected to survive 25 months, much less 25 years. But here we are, in May of 2014, a surviving, if not actually thriving, antiquarian book shop, on Webster Street in Alameda, with a [sometimes] open door, and a decidely lazy shop dog one must step over to browse the shelves. Also one year ago this month, the firm hired Margueritte Peterson, its first full-time employee, who, by accepting our modest job offer, fulfilled a personal desire to join our quaint trade, and so journeyed from Florida to California to take-on the not-inconsiderable tasks as my Aide-de-Camp. 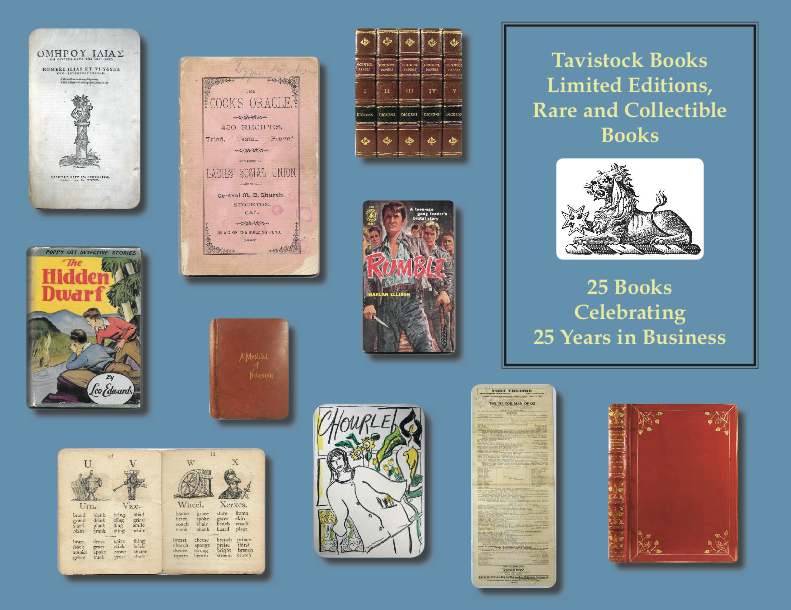 With these thoughts in mind then, we issue our first full-color pdf catalogue, comprised of 25 items, selected from stock, which represent the firm’s subject specialities, as well as the overall eclectic & diverse nature of the Tavistock Books inventory. Should you have queries regarding any of these 25, or other items you may find on our site, please don’t hesitate to contact us. We thank you for your attention, and we hope you enjoy browsing our catalogue, and/or the other listings found here on the website.